Lalin St. Juste and Akiyoshi Ehara of The Seshen will be at The New Parish on Feb. 2. 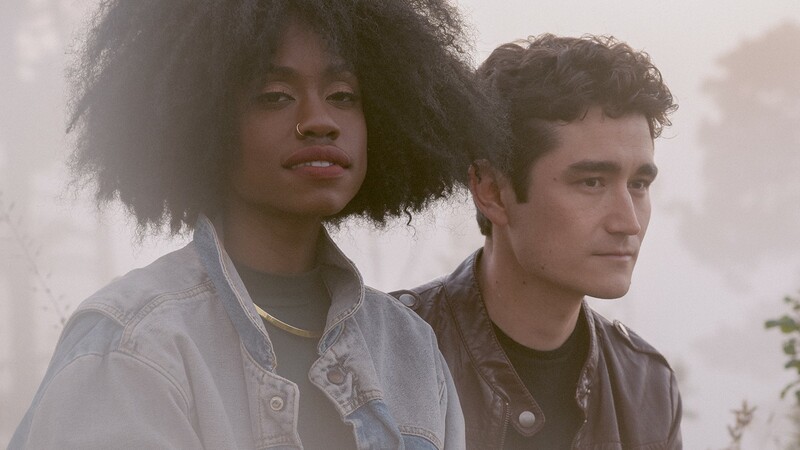 When they first started out, Bay Area-based electro-soul group The Seshen embraced the cosmos, projecting an outer space vibe with skittering synths and stream-of-consciousness lyrics. Then, their 2016 debut, Flames & Figures, with new record label Tru Thoughts, found them shapeshifting into something more colorful and bold, with lead singer Lalin St. Juste’s mesmerizing vocals at the forefront. Now, in 2019, the group is headed in a sparser, more vulnerable direction, with a new album slated for a late summer or early fall release. The Seshen is a six-piece group with a massive live sound, but Ehara and St. Juste are the group’s heart. They live and write the band’s music together in their El Cerrito home, where Ehara takes care of production and St. Juste writes the melodies and lyrics — with, of course, input from some of the other bandmates. Back in September, The Seshen dropped a new single, “Eidolon,” which is a term from ancient Greek literature referring to a phantom or specter. Rhythmic spoken word-style verses continuously lead back to an urgently delivered chorus: Everyday you’re melting away seeping into foreign ground. It’s a fitting song for the current U.S. political climate, with the phantom in question being the persistent presence of those resisting corrupt, bigoted figures in power. “People who are resisting are that phantom who will follow. There’s no way to get away from the fact that people are going to keep resisting and keep being resilient,” St. Juste explained. “Eidolon” will not be on the new album, but thematically, perhaps it’s a look at what’s to come. Diving deeper into vulnerability is something St. Juste has found very challenging, but also essential to her growth as a human being — and to her ability to connect with listeners. One song on the forthcoming album, which is an homage to the rigid funk rock sound of the Talking Heads, is about dropping all pretenses and no longer pretending be fine when you’re not. “I know I love to smile and whatever, but I don’t want to have to do that,” she said. He wants to believe that people are still looking for that unique connection in their pop music. Therefore, on the new album, he’s been trying to strike a delicate balance between accessibility and more bizarre, experimental flourishes. Overall, Ehara describes the new direction in style as more “bare.” The album’s visuals are set to match — aka a strong black and white aesthetic. Also, expect more live instrumentation, strings entering the mix for the first time, and a step deeper into the rock side of their influences. Both bandmates cite Broadcast, a psychedelic electronic English rock band, as a major source of inspiration, alongside Brazilian music. A few months remain before the album is released, but The Seshen will be previewing some of the new material live at its upcoming show at the New Parish on Feb. 2 with Sh8peshifter and Mahawam — an all-Black lineup for Black History Month, St. Juste noted. Having so many members, the band doesn’t always get the chance to play shows with its full roster — on a U.K. tour last fall, just three of them made the overseas journey. But playing a show in Oakland means a much more robust lineup on stage. Plus, it was important to the band members to share the new songs for the first time with an intimate hometown crowd. “It’s very sensitive sharing new things, so we wanted a nice loving crowd, which hopefully it will be,” St. Juste said.